Leave it to social media to put a company in its place. But, plot twist, the company is listening. PORTLAND, Ore. — Leave it to social media to put a company in its place. But, plot twist, this time the company is listening. Welcome back to the world of Twitter, where opinions are limited to 280 characters but are quite loud. Cranium Apparel, a gaming apparel company, was attempting to be inclusive with their latest piece of clothing. But they fell short. They launched a jersey-inspired dress for women in e-sports. The intentions were decent, of course, as women in the gaming community are often overlooked, but the execution wasn't the best. In fact, no women were consulted in the making of the garment, according to Cranium Apparel. However, this is not a story about a company sticking to its sexist guns. 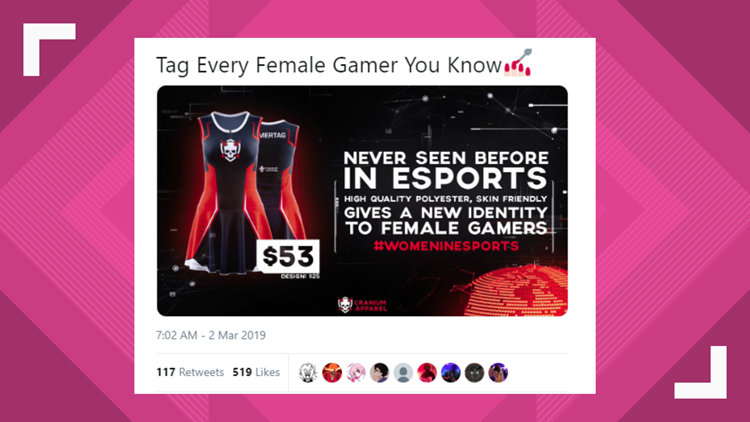 Instead, Cranium Apparel is crowdsourcing what female gamers actually want and has assured its customers that this dress can be bought regardless of gender. Cranium is taking the criticism constructively and say that women-fit jerseys are on the horizon and they will be size-inclusive like all of their apparel. This is, however, a cautionary tale of making sure women, non-binary people, and people of color have a seat at the table in the nerd community to make sure things like this don't happen in the future. Destiny Johnson is a digital investigative reporter who does not play E-Sport game but is basically a professional Tomb Raider. She reviews comics on YouTube weekly. You can reach her on twitter @hello_destiny.